Bunker Punks has been in development for over four years and the retro-inspired rogue-light is finally out. The basic premise of the game and its core gameplay loop works, but a lack of variance hurts this post-apocalyptic excursion. The story follows a group of renegades who are trying to take down the mega corporations that have taken over following the collapse of the world. Even though you can only choose between two characters at the start, the persistent system (more on that in a minute) unlocks more over time. 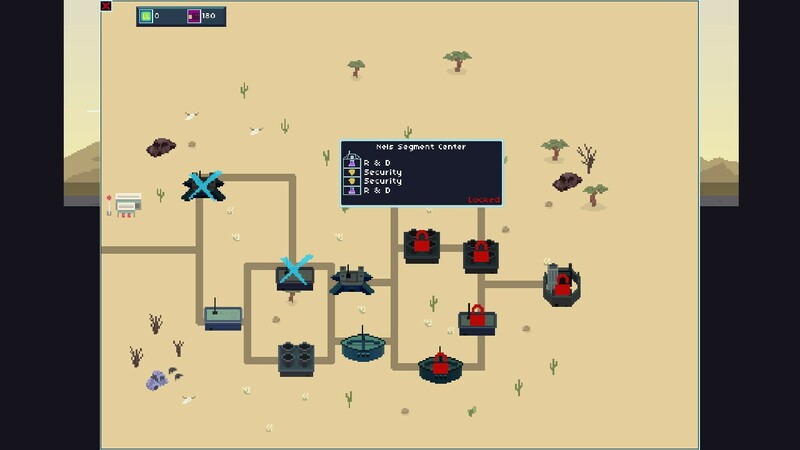 The basic idea is that you choose a bunker to attack; made up of 2 or more procedurally generated floors. Your mission is to reach the elevator at the end of each floor; which is always guarded by a tougher enemy. In each bunker you’ll find weapons, gear, and most importantly: creds and tech. Each character has a preferred weapon and special abilities to use during a level. The different weapon types have three variants, varying in rarity. Combat is old school shooting at its simplest, as players can run at high speeds shooting without ever needing to stop or reload. Each character builds up chi by getting kills to use their special moves. Once a building has been completed, you’ll be able to see how Bunker Punks persistent system operates. Bunker Punks operates with two layers of persistence. During a play, you’ll spend creds to upgrade your bunker after each building is finished. These upgrades will passively affect how your characters perform. Each room can fit three additional upgrades that allow you to fine-tune your characters for that playthrough. Gear, found in a level or bought at a store, provides either armor bonuses or adds damage to a specific weapon type. At the start of playing the game there is a lack of variance, which is factored into the second layer of persistence. After your game is over, you can spend your tech on unlocking new content that can appear in later games. This includes the additional weapon variants, new gear, new rooms and upgrades for the bunker, and new characters. 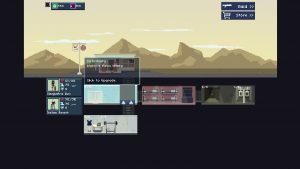 Having one persistence system improve the other is a smart idea, and does give Bunker Punks an engaging gameplay loop. Unfortunately despite the persistence, the game lacks a strong sense of variance. Bunker Punks’ main problem for me was that it felt that the runs started to all bleed into each other. While the player will be unlocking new items, nothing changes the actual play of the game. Each floor is about two minutes long with no hidden secrets or bonus things to discover. When I spoke with Shane on the cast, he talked about not wanting to introduce things that would make the game harder, but there is just such a limited pool of possibilities right now. The persistent upgrade system works over the long term, but the game doesn’t have enough variables at the start. Your first several runs will be full of you finding the same shotguns, pistols, and assault rifles again and again. Since every piece of gear is hard coded, it makes it very easy to find the build you want and then you won’t need gear any more. You can only do each bunker once in a chosen playthrough. If your best (and most equipped) character dies, you could be left in a position without the means to proper outfit someone else for the harder bunkers. Speaking of characters, due to the rigid nature of the weapons, it does create some balancing issues. As an example, Cleopatra Rex who specializes in assault rifles can’t do much against melee enemies. The reason is that assault rifles do more damage at range, and have a penalty at close, and charging enemies will not be within her best attacking distance. Death can come pretty fast in Bunker Punks. 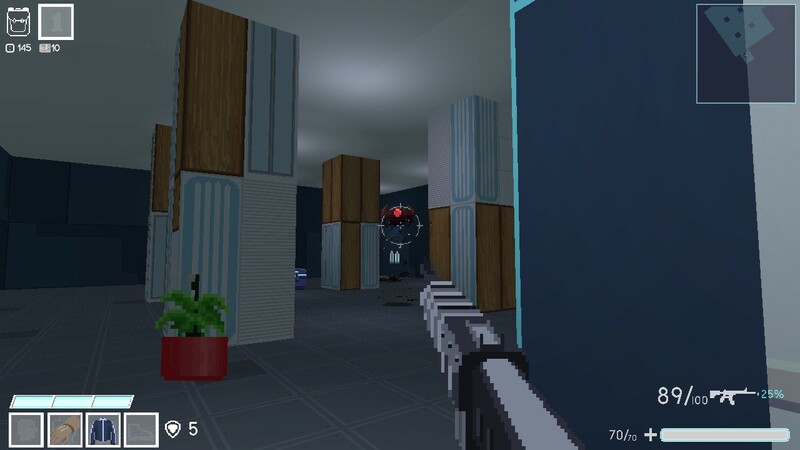 As with old school design, many enemies have no attack animations and can fire at any time. Get caught out of position or in crossfire and your character is dead. New unlocks are not a given unlike the early runs of The Binding of Isaac. Since tech can only be found as random drops, it means that you can have entire runs where you won’t be able to afford any new upgrades for the next; with no in-game rewards of new unlockable content. Normally when I say that I wanted more in a video game that it’s not a bad complaint, but unfortunately it is this time. Just like other rogue-light-styled games, Bunker Punks begs for more supplemental content to create variance. I almost think that the game should have had about half the unlocks of weapons and gear as a given from the beginning and then expand things out from there. This is not a bad game, but fighting an army of post apocalyptic robots should have more variety to it. For more on Bunker Punks, be sure to watch my first look and listen to our cast with designer Shane Neville.